What is USPS First Class Package International Service? If you are shipping small, inexpensive items such as books, health and beauty products, clothing, or accessories, First Class Mail International is the lowest cost option to ship your packages overseas. As a cost example, sending a 1-pound package from the United States to Cancun, Mexico would cost $36.81 by Priority Mail International, whereas it would only cost $19.71 to send by First Class Package International Service (Commercial Base rates). Flats and packages may not exceed 64 ounces, and packages cannot be more than 24 inches long and 36 inches in combined dimensions. You do not need special USPS envelopes, packaging, or labels to use First-Class Mail International; simply prepare your letters, flats and packages as you would for domestic mail. This means that your return address—including the country—should go in the upper left corner, with the recipient’s address in the center. If you use Stamps.com, the software will enable you to print address labels from the convenience of your own home or office. 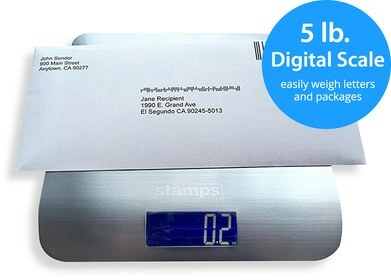 You will also need to weigh your mailpiece to ensure that it does not exceed the weight limit for First-Class Mail International deliveries, and to calculate the cost of mailing. 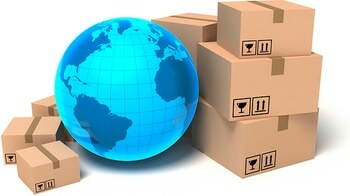 Stamps.com software will automatically perform the rate calculation based on package size, weight, and delivery destination. If you are sending a flat or package you will need to fill out a customs form, which asks you to describe the contents and value of the package and indicate whether it is a gift or merchandise. You can obtain custom forms from your local post office and fill them out by hand. If you use Stamps.com, the software will automatically fill out your customs forms for you.